CrossMgr Software | The ultimate software for scoring bicycle races. CrossMgr is the ultimate software for scoring bicycle races. RFID chip triggered photo from USB camera controlled by CrossMgr. Since 2009, CrossMgr software has been used to score hundreds of cyclocross races around the world, and has been used for many other types of bicycle races including road, criterium, time trial, mountain and para-cycling. CrossMgr supports both manual bib entry from a keyboard, mouse or touchscreen, and automatic RFID chip data collection from J-Chip, Impinj, Orion and Alien RFID readers. 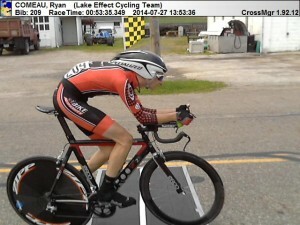 Integrated support for a USB camera provides finish line pictures for every racer. CrossMgr produces detailed real-time results to a web page, and provides results that can be uploaded to USAcycling.org, WebScorer.com, and Bikereg.com. The ultimate software for scoring bicycle races.